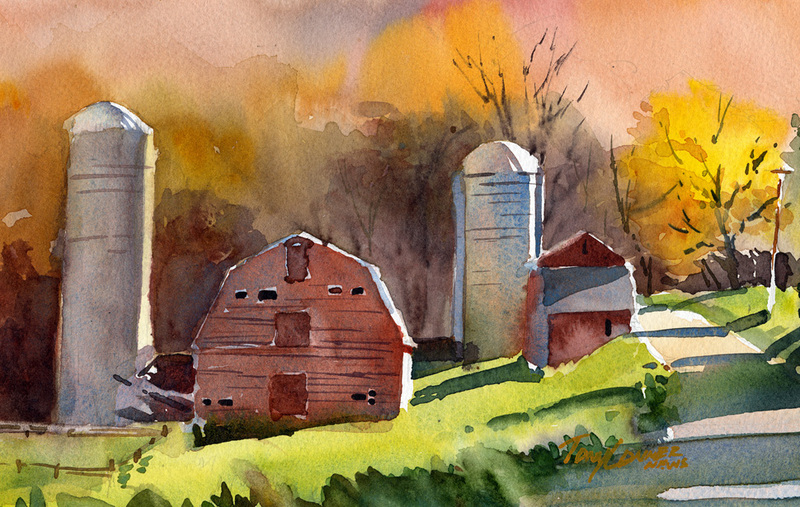 I kick off this new series with a painting that is typical Vermont – slanting light on a misty October morning, just catching barns and silos of Nolan Farm in West Arlington, Vermont. The foliage is at peak color while the bright sun casts long shadows over the landscape. This scene was painted over Columbus Day weekend, typically the time when autumn leaves are at their most colorful. When one pictures the season of autumn in their heads, it is images of beautiful leaves at peak color lit by brilliant sunshine that likely comes to mind. In reality, the “peak” season lasts a matter of days at most. It is a short, but glorious time of breathtaking beauty. Sorry, this painting is sold. All paintings from the Light & Landscape Series are available for purchase at direct-from-the-artist prices. Why? Direct sales save me the cost of framing, transporting, carried inventory, promotions and gallery commissions.